Seasonal shedding is perfectly normal for rabbits, as are the occasional clumps of fur found in their cages from grooming. 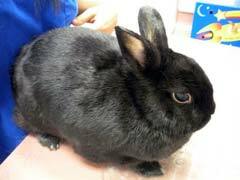 On the other hand, not all rabbit hair loss is harmless, and can mean serious conditions requiring veterinary care. Rabbit fur mites (the parasite Cheyletiella parasitivorax) are one cause for excessive hair loss. Usually starting as rabbit hair loss around the face, neck, and back, the mites leave thick, dry skin resembling dandruff. Another culprit for rabbit hair loss (along with other small animal, dog, and cat hair loss) is the Sarcoptes species of mite—known commonly as mange. These give rabbit skin problems as they burrow under the skin, and make the hair fall out in patches. The skin exposed is rough and scaly, possibly with a musky smell. Animals often make mange worse by scratching at the affected areas, leading to risk of infection. Luckily, parasite infection is easily treatable. Other forms of infection can be the source of rabbit hair loss, such as rabbit eye infection or forms of fungal infection. In the case of fungal infection, sores appear on the skin, which in turn make the fur fall out. With eye infection, this causes an over-production of tears. Tears being naturally caustic, this will irritate the surrounding skin and cause hair loss in those areas. When caring for rabbits, it’s important to monitor any unusual hair loss or behaviors. If hair loss becomes a concern, seek a veterinarian’s advice.